Nip rollers, also known as pinch rollers, are key parts of the manufacturing machinery used in the paper, lamination, film and foil converting industries. 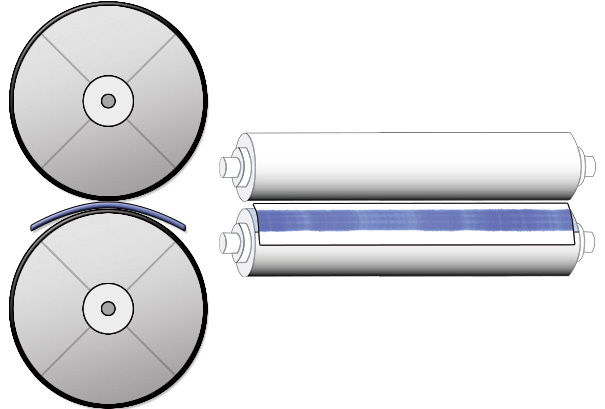 A flexible material substrate such as film, paper or foil, also known as the web, passes between two nip rollers where force, or compression, is applied. Depending on the specific application, some nip rollers can have a urethane or silicone cover. Other applications may have crowned rollers. At times this is necessary to overcome deflection, or bowing, of the rollers due to the applied force. Other applications require that both rollers be driven, such as in applications where the web is being pulled through the rollers, creating concerns such as consistent and equal roll speed and uniform pressure between the rollers. Most issues concerning consistent and uniform pressure load, roller alignment and parallelism can be easily diagnosed by taking a nip impression using Fujifilm Prescale. Roll Deflection is caused by the weight of the roller itself and the force acting upon it. In this case, forces act on the outer edges where the rollers are supported by the machine. The longer the roller, the greater the chance for deflection, allowing the center of the roller to sag or bow. To account for this, a crown can be applied to the roller. This allows for uniform pressure to be applied to the web even though there is deflection. This principle is sound in theory, but achieving the exact crown can be difficult and costly. Crowned Rollers are often used to improve nipping, or pinching results between two rollers but if the nip pressure is uneven it can cause a number of issues such as wrinkles or folds in the substrate, the web not tracking properly, or shifting side to side on the roll. In the lamination process for example, uneven pressure can cause defects between the two bonding surfaces such as air bubbles through the center of the film or laminate. By applying more pressure, the operators are only increasing the amount of deflection by adding force only to the ends of the rollers, making the problem worse. 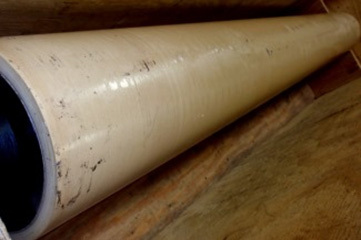 Worn Rollers will apply inconsistent pressure across the worn surfaces. Intermittent defects or ?blips? will start to appear on the substrate. Over time, these defects will grow. Either the roller will need to be replaced or it will need to be resurfaced. In the case of rollers with a Urethane or Silicone cover, only the cover will need to be replaced. Issues such as nip roller parallelism or alignment can cause the rollers to wear unevenly. Factors such as material hardness can also affect how rollers wear and how they react to the substrate. Fujifilm Prescale is a pressure indicating and recording sensor film that is similar in use and effect to Litmus paper in that it takes a 'snapshot' of applied pressure via a chemical reaction causing a correlated color change. The instantaneous result displayed on the film shows only a moment in time of pressure distribution and magnitude. Fujifilm Prescale is a single use film-like material, showing only the most recent and most intense pressure in any given area. It is not reusable as it does not return to its new or unused state once subjected to any forces. STEP 1: Choosing the right Fujifilm Prescale type for your application. Start by identifying the pressure range best suited for your process, ranging from Ultra Extreme Low 0.87 - 7.3 PSI (0.06 - 0.51 kg/cm2) up to Super High 18,500 - 43,200 PSI (1,300 - 3,000kg/cm2). STEP 2: Cut to size. Fujifilm Prescale can be 4 or 8 mm thick, depending on the pressure range, as it can be 1 self-contained sheet or 2 separate sheets working together - a donor and receiver sheet. Start by choosing the amount of area needed to be covered (the nip width) and cut the nip impression paper accordingly. STEP 3: Position the film and apply an operational load. In order to apply operational force to the Fujifilm Prescale, feed it between the rolls. NOTE: Be sure to adhere to all safety procedures before proceeding. Do not bypass any guards or safety measures without properly 'locking out' the machine. Once the film has passed through the rolls, it will instantly display results by via color change. STEP 4: Analyzing the results. When using the film, force measurements will vary based on length of exposure, temperature and relative humidity. Liquids and oils from skin contact can damage the film and potentially skew the outcome. The results appear as variation in the magenta color spectrum. The darker the impression, the higher the applied force. The lighter the impression, the less force applied. A uniform color across the nip width means that the nip pressure was consistent and the roll was aligned and parallel. Inconsistencies become apparent via color variation.